In Moscow directly called for a Russia without Putin. In a network there were photos and video from the March in Moscow, dedicated to the memory of Russian opposition politician Boris Nemtsov, who was killed on 27 February 2015. In the video, filmed by a member of the March — thousands column of people under the flag of Russia. Marchers chanting “Russia will be free”, also heard the slogans “Russia without Putin”. 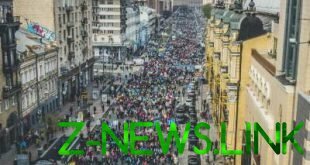 The participants of the March report that there were also slogans “the Murderer Nemtsov at the Kremlin!” and “Down with KGB power!”.